Audi exterior designers are known in the automotive world to be among the laziest in the business, they’re the automotive design equivalent of koalas: sleeping for 18 hours a day until a deadline approaches, at which time they’ll just pull an existing design from the drawer and make a few quick changes and then convince their bosses that evolutionary design keeps the outgoing model from looking old, which should help resale values of the brand. And the amazing thing is that they actually get away with it, because apparently it does seem to work like that, not only in theory. And now Volkswagen designers seem to have been contaminated by the same laziness virus, as they’ve first proven with the “eighth” generation Passat, which really should be called the seven-and-a-halfth generation, especially when looking at it from the rear three quarters. Usually, a new model generation would imply that the car is completely redesigned, while a facelift means that the so-called hard points, like the window frames and door pillars stay the same, and only minor changes are made to the headlights and taillights, with subsequently the hood and boot lid, and sometimes even the front wings. But with the Passat, they couldn’t be bothered to change the C-pillar, or even something simple like the shape of the rear lights or fender, which means it should be classified as only a minor facelift, even if the platform and engines have been completely reworked. The designers must have realized this when they saw the final clay model, and in order to make the world believe they had actually done any work, they sneaked back into the studio the night before the design was frozen and quickly made the belt line a bit more pronounced. I can understand why Opel /Vauxhall has used a similar strategy with their “new” Corsa; just changing the front end and and tail lights but still calling it a new generation, because General Motors has been on the brink of bankruptcy only a few years ago and its European operations, including Opel and Vauxhall, are still losing money. Since the development of a new car takes a few years, the current Corsa has been given a low-budget makeover in an attempt to stop the sales slide until the all-new model is ready. But Volkswagen isn’t struggling for cash at all. In fact, they’re probably the only automaker actually making a profit in Europe, and thanks to the millions of cars they sell each year in China and their success at making timing chains and DSG transmissions last exactly one day beyond the government mandated warranty period, the VW Group is sitting on a pile of cash that would enable them to fit their cars with timing belts made from remelted coins and clutches made from Euro bills and they’d still be able to buy Sergio Marchionne a private island to hold week-long Bunga Bunga parties, just to convince him to sell them Alfa Romeo. Unfortunately for them, Sergio is only half-Italian and his Canadian other half wouldn’t know what to do at a Bunga Bunga party except to put maple syrup on everything he sees, including the ladies. Wait, we’re getting to far off my point now. What I’m trying to say here is that Volkswagen isn’t slowly evolving its design just to save money on design and development, but as a strategy to sell more cars. You see, like with art, it takes time to get used to an all-new design and to appreciate the beauty of it. But once people have become familiar with a certain design language, they’ll feel comfortable with it and “trust” it. So by staying very close to the already familiar design and making only minor changes to make it look fresh again, the Passat and Caddy are new enough for first movers to want to have the latest version, while more conservative car buyers will feel comfortable with the familiar appearance of the cars. Being able to appeal to both the trend-sensitive and the conservative car buyer, VW broadens its pool of potential customers and is therefore able to sell more cars. Which helps them pile up even more cash so they can step-by-step take over every other automaker until their only competitor will be Alfa Romeo. And then they can stop designing after all and just spend their time having Bunga Bunga parties on their private island. When a car maker gets very big, risk becomes a four letter word. As long as they keep selling, they will do unimaginative design. Thanks, Andy! I really appreciate the compliment, and I’m glad you’ve enjoyed it. I like the premise of this article, as well as the writing – a really nice read! As a big VW/Audi fan it’s a bit hard to stomach the “lazy” notion, but I understand that’s how most people perceive the current design trends at VAG. 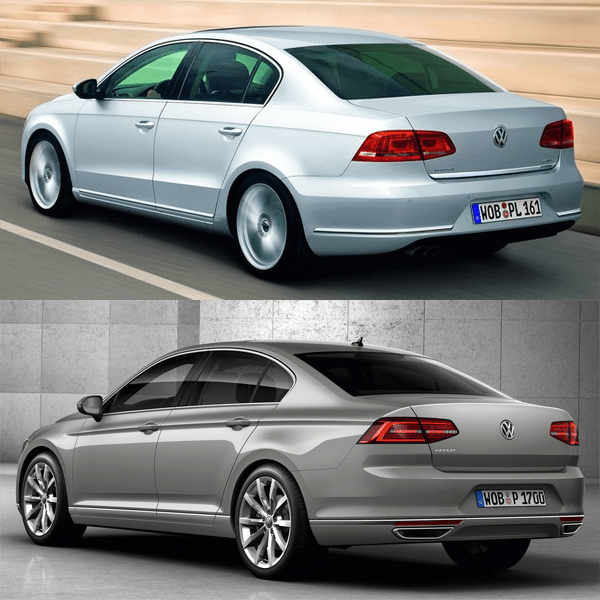 The way I think of the Mk VII Passat (the heavily facelifted/not quite new one) as a deliberate “prequel” to the Mk VIII model – it introduced some design features such as the C-pillar and the rear lights, which the newer model massaged and improved on. This is a strategy that BMW has been pursuing, with great commercial success, with its 3-series at least since the E36 in the mid-90s. Is it very innovative? Maybe not, but I feel like the amount of effort spent designing these cars is greater than almost anything else on the market. 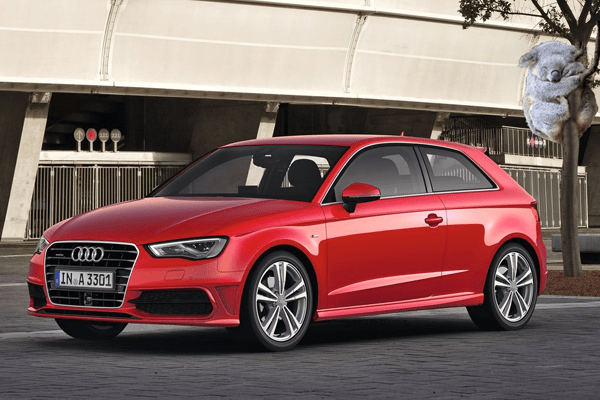 Personally, I think VAG has a bigger problem on their hands, and that is that their design languages are getting too close across brands (Audi, VW, Seat, Skoda). great analysis! You may be on to something with VAG’s prequel design strategy, and you’re definitely spot on about the proximity of the design languages between the brands. In fact, that’s been a possible future article brewing in my mind as well for some time. And thanks for the compliments. Hi: I’d have to disagree with the judgement that VW designers are lazy. As an industrial designer by training and trade, I respect VW’s careful approach. Their work is almost always flawlessly executed and if you don’t like it so much there are lots of alternatives that are more emotional. It takes a lot of work and intelligence to create a car, also the quiet ones. I have seen the new Passat and it has a remarkable presence and seriousness which ought to scare its peers, none of whom are actually bad (Laguna excepted). It’s quite easy to do a strident car. What VW do is harder: nudging buyers out of competitors’ cars without making existing VW owners feel their old car is inferior. In the old days Mercedes made a nice living doing this and their older cars such as the W126 are still vehicles you’d feel good driving and been seen in no matter how tatty they get. The best design is the least design as Dieter Rams said! I see what you mean, so maybe I should have named the article “Why Volkswagen designers seem lazy, but are smart”. Indeed, it’s very impressive how successful they are at selling their cars despite the “unimaginative” design. They’ve clearly found a design language that works for them and that keeps appealing to large audiences in the long term, even when very slowly evolving. You’re right to say other brands should be afraid, because most others (the first that come to mind are Ford of Europe, Mazda, Peugeot and Renault) introduce a new design language every new generation, or don’t even have a true design language that connect all of their models (Fiat, Suzuki and Kia before they hired Peter Schreyer). Because Volkswagen Group brands make such minor changes to their models, the old models don’t immediately look old and keep their resale value, while a steady flow of repeat business comes from people to whom the design appeals and who simply want the latest version. More extreme love-it-or-hate-it design makes the outgoing model look old quickly, while also aging quickly itself, needing another even more extreme design to follow it, potentially increasing the group of haters, while confusing others. One of the strengths of the Passat is that it’s simply a very representative and intelligent choice in any occasion, be it as a family wagon or as a business sedan, and that’s partly a result of its low-key design. But the only thing it isn’t good at is to stir my senses into wanting one. Richard, I fully agree with you – VW designs are very smart, especially of late, introducing just enough “new” to make sure others know you’ve bought the latest model, but not so much that owners of the previous generations feel inferior. And the latter part is crucial in keeping VW residual values way above their competitors. That said, it hasn’t always been this way. As recently as in the mid-2000s VW went through a design slump, when it tried to be different with the Passat B6 (2005-2010) and the Golf Mk V. The former just ended up looking misshapen and had an awful silver “beard”, while the latter was technologically great but looked like a jelly-bean. The design recovery and resulting cohesion since has been remarkable, and I especially like the instantly-recognizable VW grille that unites everything from the Polo to the Toureg, Caddy and Amorok.